After the nuclear deal, there are three possibilities for the future of U.S.-Iran relations. U.S.-Iran relations is an unresolved conundrum. Officially, Iran and the United States have not had diplomatic relations for 38 years. The Joint Comprehensive Plan of Action (JCPOA), which was signed in 2015 by Iran and the permanent members of the United Nations Security Council and Germany (P5+1), was also the first official agreement between Iran and the United States since 1979. While the post-JCPOA era has created a positive atmosphere about the future of the two former friends, the hopes of the two nations enjoying better relations have so far proved elusive. In fact, no substantial change has occurred in the diplomatic climate between the two countries since the implementation of the deal in January 2016. This essay is an attempt to forecast the future of the U.S.-Iranian relations. I foresee three different possibilities, but the most likely scenario will see both countries maintain the the status-quo and possibly cooperate on a case by case basis. To avoid miscalculations, Iran and the United States must continue to abide by the JCPOA provisions, and maintain a direct channel of communication. One of the foreign policy legacies of President Barack Obama was to restore diplomatic relations with Cuba in 2015. The president had previously attempted the same approach of engagement with Iran, when in 2009, he directly appealed to the Iranian leaders and called for dialogue between the two countries. Unlike his overture to Cuba, his outreach to Iran was quickly rejected by Iran’s Supreme Leader Ayatollah Khamenei, who has the final word on major foreign policy decisions. During and after implementation of the nuclear deal, he has made it clear that he does not wish to expand U.S.-Iranian contacts beyond the nuclear talks. There are a variety of reasons that could explain Khamenei’s reluctance to talk to the United States. For one, it is possible that the aging leader wants to leave the issue of relations with America to his successor. As a confidant of Ayatollah Ruhollah Khomeini, the founder of Islamic Revolution, Khamenei does not want to be responsible for a rapprochement with the “Great Satan.” A swift ideological reversal, will most likely undermine his legitimacy as the leader of revolution. In addition, as a strong believer in the “Westoxification,” Ayatollah Khamenei believes that the West, and in particular, the United States is bent on using soft power to overthrow the regime and regain its grip over Iran. In his view, normalization of relations with the United States would pave the way for the “toxic” Western culture to infiltrate and weaken the revolution. Ayatollah Khamenei has even dedicated a separate website to directly address the youth, who in his opinion, are the main targets of the “Cultural Invasion.” Further, in his view, if Iran yields to U.S. pressure on any issue (e.g. human rights), the U.S. would bring another “excuse” to increase the pressure on Iran to weaken the regime, and eventually replace it with a subservient government. Finally, a détente with Washington would dramatically tilt the balance of power in favor of pragmatic forces, who are in favor of talking to the United States, giving them too much power over hardliners. This in turn could alienate his hardline constituents, creating dissent among them. In such a scenario, the hardliners, who are mainly in control of Iran’s security apparatus, may take advantage of the situation, and even threaten the position of the Supreme Leader himself. Therefore, as long as Ayatollah Khamenei is in power, a dramatic shift in U.S.-Iran relations seems unlikely. On the other hand, the experience of nuclear impasse prior to the JCPOA proved that intransigency and avoiding direct talks is futile, and only serious diplomacy creates a path forward for both countries. In the absence of a political will for détente, Iran most likely will continue to maintain the status-quo with the United States, with the possibility of case by case, and unofficial, cooperation on issues of mutual interest. The administration of President Hassan Rouhani has no interest in escalating tensions with the United States, especially since the implementation of the JCPOA. The quick release of American military personnel who inadvertently had entered Iranian territorial waters, for instance, is a testament that Iran does not seek confrontation. Given the already volatile status of the region, the United States on its part, is not interested in increasing tensions in the Persian Gulf region either. The United States finds some of Iran’s actions, such as its ballistic missile program and its actions in Syria and Yemen, provocative and threatening to its interests. On the other hand, Iran considers the U.S. presence in the Persian Gulf a major security threat. Despite these issues, there are indeed areas of mutual interest for cooperation. Defeating the Islamic State (ISIS) has been a major priority for both Iran and the United States. While both countries have rejected any official cooperation, unofficial reports indicate that Iran coordinates its operations in Iraq with the United States. Recently, U.S. Secretary of State John Kerry even stated that he finds Iran’s activities (with regards to ISIS) in Iraq helpful. Because tensions are high in the region, and the possibility of a miscalculation is always present, a direct line of communication between high level officials is necessary. 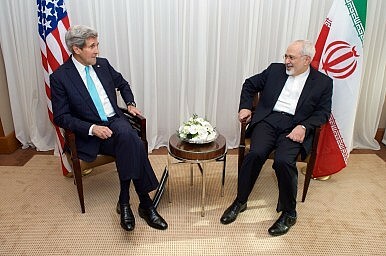 Currently, Iran’s foreign minister, Javad Zarif, and Kerry regularly communicate through email. This proved to be essential in securing the rapid release of American sailors, when Kerry was able to quickly contact his Iranian counterpart. The next U.S. administration should follow suit and continue to maintain high level direct contacts with the Iranian officials. A third scenario looms for the future of the U.S.-Iran relations. Under this scenario, which seems unlikely (but possible), the JCPOA will collapse, and relations will strain even further. The situation could further be exacerbated if Iran or the U.S. engage in retaliatory actions. Iran could abandon its obligations under the JCPOA and resume its nuclear activities. The United States, for its part, could reinstate nuclear related sanctions. In short, the situation would return to what it was prior to the signing of the nuclear deal. This could in turn result in more provocation from the Iranian side, thereby, increasing tensions in the Persian Gulf. There are strong forces already doing their best to derail the nuclear deal. In Iran, the hardliners accuse Rouhani of giving up hard-earned nuclear achievements for no practical returns. As a result, recent polls in Iran suggest that the support for the nuclear deal has dropped to 62 percent (compared to 75 percent in 2015). Likewise, in the U.S., Obama’s Republican opponents have not sat idle. Recently, the House of Representatives passed legislation that, if it comes into law, would prohibit the sale of Boeing commercial planes to Iran (one of the provisions of the nuclear deal). Against such pressure, it is imperative for both countries to continue to abide by their obligations. The U.S. should increase its efforts to facilitate legitimate businesses with Iran so that the pragmatic forces can secure the next presidential elections, which is due to be held in 2017. A second term for Rouhani, along with the support of Ayatollah Khamenei, would secure the implementation of the nuclear deal for another four years. On the other hand, Iranians should eschew provocative actions that could potentially lead to punitive measures from the United States. As the final months of Obama’s administration are approaching, it is important that his successor also continues to abide by the nuclear deal’s provisions. The U.S. presidential election in November will have a great impact on the future of JCPOA. While the Democratic candidate, former Secretary of State Hillary Clinton, has supported the deal, Republican candidate Donald Trump has vowed to dismantle the Iran nuclear agreement. It is safe to argue that a workable U.S. administration would serve the interests of both sides in implementing the provisions of the nuclear deal, thereby affecting the future of the U.S. Iran relations. The United States and Iran both have legitimate reasons to be irritated at each other’s actions; however, 40 years of mistrust and animosity have not brought any benefits for either side. The JCPOA, while limited in scope, demonstrated that outstanding issues between adversaries can be resolved through diplomacy and open communication. However, in Iran, Ayatollah Khamenei, who supported the nuclear deal, has so far expressed his unwillingness to engage in comprehensive talks with the United States. Therefore, any substantial shift in the U.S-Iran relations seems unlikely at the moment. In the absence of clear options, both countries should take advantage of the opening created by the JCPOA and maintain high level contacts. Iranian and American officials should not be sidetracked by domestic and international forces that are working to sabotage the deal. Instead, they should both focus attention on keeping up their obligations under the JCPOA, and to look for opportunities to expand their dialogue. Sina Azodi is a former Research Assistant at the Woodrow Wilson International Center for Scholars and a graduate of Elliott School of International Affairs (B.A & MA), George Washington University.